Recent trips to the airport have left me in amazement at the seeming decline in airline provisions and the imposition of new fees on almost every service of value to travelers. Disheartening to say the least, what was once taken for granted can now ding you for a hefty chunk of your hard-earned money. With many airlines struggling to stay afloat, these fees are necessary in order to maintain their current level of service and implement new technologies that help them to remain competitive. 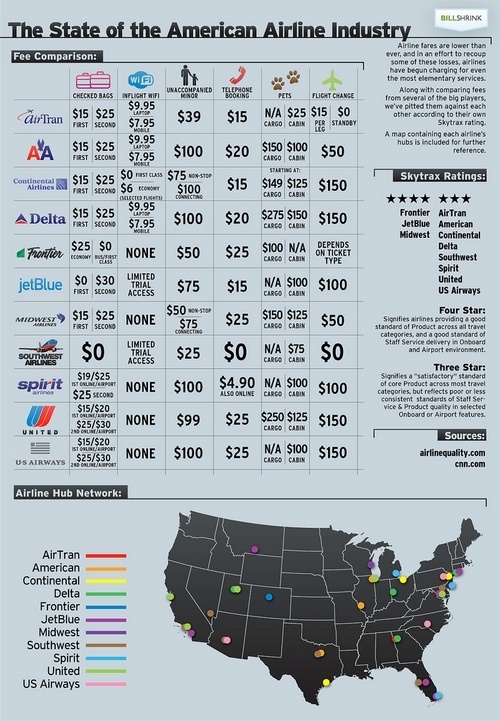 Here is a handy guide to each airline’s pricing for additional services to help you know for what you are going to have to pay, before you buy your ticket.